Learning how to make savory cheesecake recipes will make you popular with your family and friends. When I think of these recipes, I think of many which are seasoned with herbs and spices. These are recipes which I generally use as appetizers or snacks. These are also very delicious but in a different category than my creamy delicious desserts. Spices like pumpkin in pumpkin cheesecake and cinnamon in an apple cinnamon cheesecake I do not consider savory to me but more desert spices. When you learn how to make savory cheesecake recipes, you will find them to usually have a cream cheese as the basic cheese ingredient. Many times other cheeses are combine it with other cheeses like feta, Parmesan, ricotta, Monterey Jack or many others. In these you might also find a selection of vegetables like peppers (sometimes hot) and onions or even meats as in the Braunschweiger recipe. Various nuts will add texture to some of the recipes. What really sets these recipes apart and make the flavor so “savory” are the many different herbs and spices which can be used. When you learn how to make savory cheesecake recipes you will have your favorite spices to add to them. Here are a few of the typical seasonings found in those recipes. GARLIC is a great addition to these recipes; how much you use in the dishes really depends on your taste. A strong flavor enhancer is OREGANO which is often used in dishes of the Mediterranean area. I use CELANTRO along with other spices in most of my Mexican dishes. I love fresh BASIL; I use it in most of my Italian recipes. All of these add a lot of flavor to these savory cheesecake recipes. Combine bread crumbs, pecans and melted butter; blend well. Spoon about 1 teaspoon of mixture into paper lined 1 ¾ inch muffin tins; press firmly into bottom. Beat cream cheese on medium speed until creamy; add feta cheese and egg and blend well. Stir into mixture milk and hot sauce; spoon mixture evenly into paper liners on top of crumb mixture. Bake for 10 to 12 minutes until set and let cool; wrap in plastic and chill. To serve remove paper liners; spoon about ½ teaspoon herbed tomato sauce on top. Cover and chill until ready to serve. Makes 48. 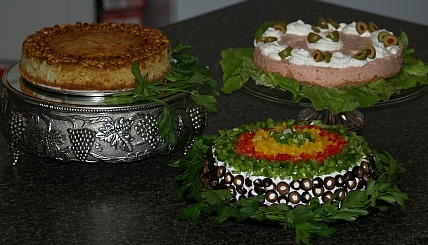 This is one of the savory cheesecake recipes which makes a very nice presentation for special parties. 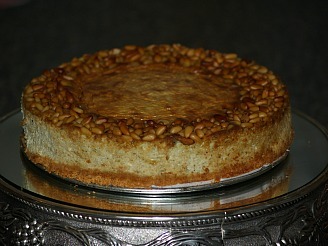 Arranging pine nuts on the top adds to the texture and taste as well as appealing to the eyes. Combine crumbs and melted butter; press into bottom of 9 inch spring form pan; bake 10 minutes. Place oil, basil, salt and garlic in blender container; process on high until smooth. Combine basil mixture, cream cheese and ricotta in mixing bowl. Beat on medium speed until well blended. Loosen cake with knife from rim of pan; serve warm or room temperature. Garnish with fresh basil; refrigerate leftovers. This is one of the savory cheesecake recipes which has no baking aside from a quick baking of the crust. 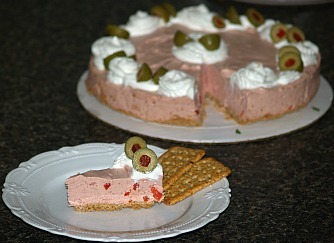 The cream cheese and Braunschweiger is a great team for any get together. Combine croutons and melted butter; press onto bottom of nine inch spring form pan. Bake in preheated oven at 350F degrees for 10 minutes. Soften gelatin in water; stir over low heat until dissolved. Combine cream cheese and Braunschweiger; mix on medium speed until well blended. Gradually add gelatin; stir in remaining ingredients until blended. Pour over prepared crust; chill until firm. Remove rim of pan to serve. This is one of the savory cheesecake recipes with all the ingredients so typical of flavorful Mexican recipes. Preheat oven to 325F degrees. Combine tortilla chips and melted butter; press into lightly greased 9 inch spring form pan. Bake for 15 minutes; cool on wire rack. Beat cream cheese on medium speed of mixer until creamy. Stir in shredded cheese, chilies and ground red pepper. Pour mixture into prepared pan; bake for 30 minutes and cool for 10 minutes on wire rack. Gently run knife around sides to release cheesecake from sides of pan; cool completely on rack. Spread sour cream evenly over top of cheesecake; cover and chill. 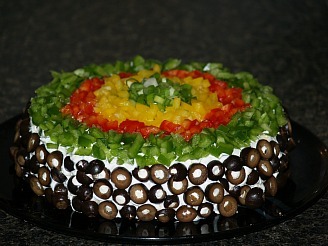 Arrange green, red, yellow bell peppers, green onion, tomato and chopped olives on top of sour cream. Set cheesecake on bed of fresh cilantro or other greens to serve; serve with tortilla chips. This is another of the savory cheesecake recipes with great flavor; guests will find hidden in the center chicken, cheese and chilies. Combine tortilla chips and melted butter; press in bottom and 1 inch up sides of 9 inch spring form pan. Beat cream cheese on medium speed until creamy. Stir in chili powder, Worcestershire sauce, salt and green onions. Pour half of cheese mixture into prepared pan. Sprinkle with chicken, chilies, and shredded cheese. Carefully pour remaining cheese mixture over top. Bake for 10 minutes; REDUCE HEAT TO 300F degrees and bake an additional 1 hour until set. Combine and blend sour cream and seasoned salt; spread evenly over the top. Cover and chill for 8 hours; garnish and serve with picante sauce.